This is a reprint of a post published on the SDL website and closely related to a previous post on the difficulties and challenges of building Russian to English MT systems. Many may not be aware that several in the SDL MT team have very significant research and development credentials, and have pioneered the data-driven approaches to MT system development. They initially commercialized Statistical MT and the members of the original research team read like a Who's Who in the MT research community. The original principals at Google MT and the developer of Moses both come from the original Language Weaver team and today you will see members of the original team have a hand in every major MT initiative in the US. 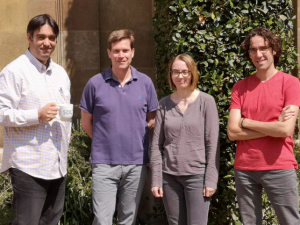 The SDL MT team also has the unique experience of working closely with linguists and translators on a long-term basis and thus have unique exposure to ongoing human MT quality assessments for most of the systems they build. In localization use case scenarios MT systems need to be assessed for PEMT suitability and that is best done by human review and assessment rather than by BLEU scores which is the metric of choice for most research teams in the industry. Thus, this accomplishment with the Russian NMT system is an assessment made with deeply trusted human assessments that have been refined over 10 years of ongoing practice. The professional translators who do these assessments are part of the permanent team of around 2,000 translators at SDL. These assessments are more reliable than automated metrics which can often be gamed or manipulated or simply be known when they should by definition be blind tests, i.e. the system should not have trained on it. 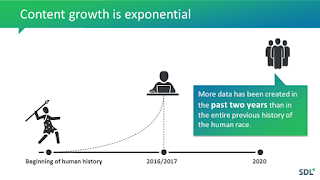 The claims to have cracked the problem are based on the very high level of accomplishment based on a metric that has gained greater reliability with the research team than BLEU and many other automated metrics which are also used in tandem. 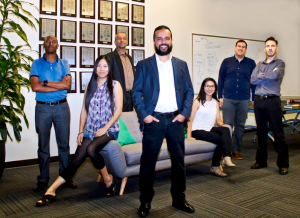 The SDL Machine Translation (MT) research team recently announced that our latest machine learning innovations and development strategies with Neural MT have resulted in a breakthrough that clearly demonstrates a significant and substantial leap forward. When testing our Russian to English MT system, the output, when measured against an extensive suite of comparative experiments to verify and validate the outstanding results, outperformed all industry standards, setting a benchmark for Russian to English machine translation. Over 90% of the system’s output has been labelled as perfect translation by professional Russian-English translators. Those who have been monitoring the progress of Neural MT systems may be aware that Russian to English has been a particularly challenging direction for MT developers. Much of the enthusiasm for Neural MT is driven by the degree of fluency and naturalness of the output, and its ability to produce a large number of sentences that look like they are very fluent and look like they are from the human tongue. We have seen that often the early results with Neural MT output show that it is considered to be clearly better to human evaluators, even though established MT evaluation metrics such as the BLEU score may only show nominal or no improvements. The improvements to human assessment are most noticeable when considering fluency and word order issues with machine translation output. However, the most common automatic quality metric used by MT developers during the R&D phase is still the BLEU score, so it is important to incorporate human assessments into the scoring methodology. The strategy adopted by the SDL researchers was to use professional human assessment as a primary means to assess the MT quality. We wanted to know the human perceived translation quality of SDL Neural MT, and understand how it compared to the human perceived translation quality of an actual human translation. SDL builds custom MT engines for production use on a regular basis, and has developed an accurate and reliable evaluation methodology to assess the quality of MT output that minimizes human bias. The evaluation team was shown the source Russian sentence and the blind translation output and was asked to score each output on a scale that had “perfect translation” on one end, and “completely wrong” on the other end. For each system, the percentage of translations that were scored as high as the human translation score were computed. The final results are listed below. 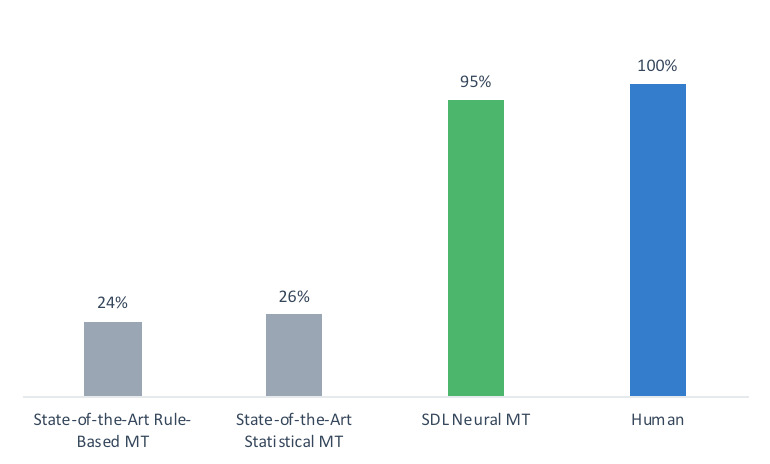 The SDL research shows that its Neural MT system outperformed all industry standards, setting a benchmark for Russian to English machine translation, with 95% of the system’s output labelled as equivalent to a human translation in terms of quality by professional Russian-English translators. SDL latest Neural MT technology is optimized for both accuracy and fluency and provides a powerful paradigm to deal with morphologically rich and complex languages. 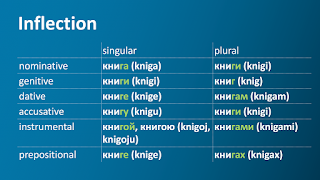 While the focus of the SDL tests and measurements was the Russian to English system, the strategies deployed by the SDL team are expected to be compatible with and be of benefit to other complex and morphologically rich languages. It is interesting to note that the best Russian-English SMT systems, even after 10+ years of research, were only marginally better than the best Russian-English RBMT systems, if at all. This points to the significant challenge presented by the Russian to English language combination, and explains why RBMT systems have been preferred by many industrial users until quite recently. The new SDL Neural MT system is very likely to accelerate this transition. 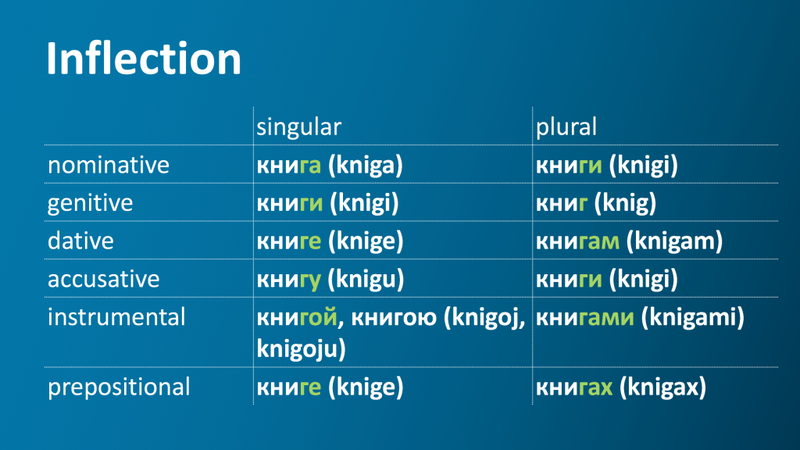 Why is Russian difficult for MT? 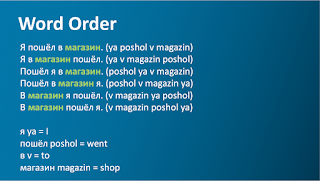 Russian has always been considered to be one of the most difficult languages in MT, mostly because it is very different linguistically from English. Russian differs from English significantly in inflection, morphology, word order and gender associations with nouns. That’s 12 forms of the same word, which are used depending on what role the word is playing in the sentence. “But they’re not all distinct; you can have the same form for different roles, like the singular genitive & the plural nominative,” says Wes Feely, Senior Computational Linguist, SDL. 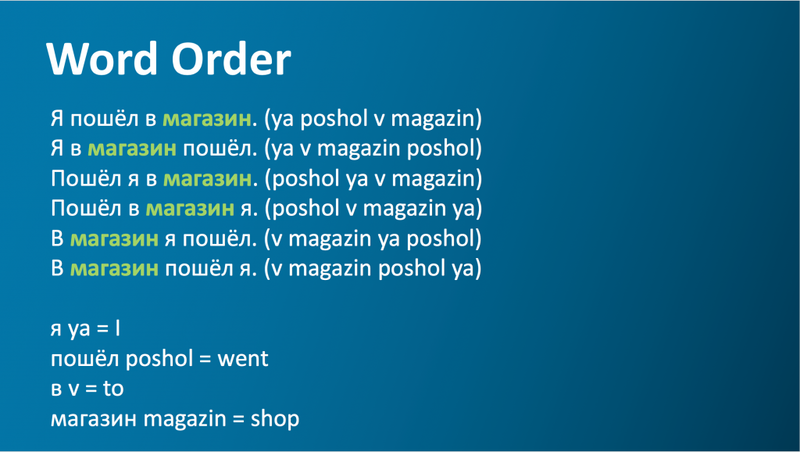 Essentially, all orderings are possible, except that the preposition “to” (в v) must precede the word for “shop” (магазин magazin). You can imagine that as sentences get longer, the number of possible sentence order structures increase. There are some limits on this: some orders in this example sound strange or archaic, and others are only used to emphasize where you’re going or who is going. But there are certainly more ways of saying the same thing than English, which is stricter in its word order. SDL’s latest Neural MT technology is able to deal with all the Russian language challenges described above and can produce fluent and accurate translations. Below are some examples from the new SDL Neural MT Russian-English system. Russian До Уистлера, расположенного в провинции Британская Колумбия, можно быстро добраться от Ванкувера на автомобиле или самолете. SDL Neural MT English Output Whistler, located in British Columbia, is easily accessible from Vancouver by car or plane. Human English Output Whistler, British Columbia, is quickly accessible from Vancouver by road or air. Russian Фестивали, спа, рестораны и бары сочетаются с бесконечными возможностями досуга на свежем воздухе, делая Уистлер идеальным местом, где вы можете отдохнуть и расслабиться. SDL Neural MT English Output Festivals, spa, restaurants and bars combine with endless outdoor activities, making Whistler the ideal place to relax and unwind. Human English Output Festivals, spas, restaurants and bars combine with endless outdoor activities to make Whistler the ultimate place to escape and unwind. Russian Директор оперативного управления Международного комитета Красного Креста Доминик Стиллхарт сообщил в воскресенье на пресс-конференции в Сане, что с 27 апреля по 13 мая в стране умерло от холеры 115 человек. SDL Neural MT English Output The Director of Operations of the International Committee of the Red Cross, Dominic Stillhart, reported on Sunday at a press conference in Sana’a that 115 people died from cholera from April 27 to May 13. Human English Output On Sunday, Dominik Stillhart, director of operations of the International Committee of the Red Cross, said during a press conference in Sana’a that 115 people died from cholera in the country between April 27 and May 13. Russian Рынок акций США в среду, вероятнее всего, начнет торговую сессию умеренным ростом на 0,4-0,5% в рамках коррекции к падению предыдущего дня, вызванному напряжением в торговых отношениях между США, Китаем и некоторыми другими странами. SDL Neural MT English Output The US stock market is likely to start its trading session on Wednesday 0.4-0.5% as part of an adjustment to the fall of the previous day caused by the tension in trade relations between the United States, China and some other countries. Human English Output The US stock market on Wednesday, will most likely start a trade session with a moderate growth of 0.4-0.5% as part of the correction to the fall of the previous day caused by tension in trade relations between the USA, China and some other countries. It is important to qualify that these results only reflect the results of generic MT systems and of generic sentences as shown above. The SDL research noted that the generic Neural MT system did not perform as well on domain specific data. As a supplier of MT solutions to the enterprise, SDL will typically adapt MT systems to the unique needs of each enterprise customer’s domain. This adaptation is also an especially challenging task with Neural MT models. In other experiments with domain adapted MT systems, the SDL research team noted that there were further improvements in perceived quality and they documented that, adaptation of the SDL Neural technology provided a 30% improvement over the generic neural engine on domain specific data. The SDL Neural MT breakthrough accomplishment comes soon after several other announcements related to their ongoing research and development, and substantial progress with taking Neural MT from a research environment to a deployable enterprise-ready technology. 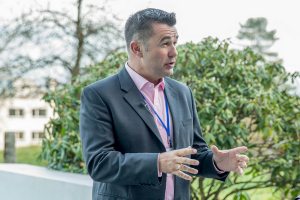 Another key requirement for successful MT adoption in the enterprise is the ability to get the system to learn and adapt to enterprise-specific linguistic requirements and preferences. This has been especially challenging with Neural MT technology which, until now, has been difficult to do without undermining the fluency and output quality. SDL researchers recently figured out how to augment Neural MT with dictionary capabilities. This means enterprises can easily adapt SDL Neural MT across multiple departments that have differing terminology, yet still maintain the translation fluency that this latest generation of MT technology is acclaimed for. Easy implementation of preferred terminology and personalization by any user with no upfront technical knowledge or training required. The SDL research team has also recently found new ways to address a major issue with Neural MT systems, namely improving system speed and throughput. This has been a general problem for Neural MT system deployments as these deployments can be expensive and slow, and any ability to improve the efficiency of private deployments are especially valuable in the enterprise use context.